Business cards, post cards, and presentation folders are some of the more important items to support your business. 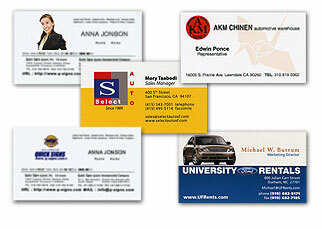 When you think about it, almost all business relations start with the passing of a business card. Quick Signs is able to provide black and white, full color, gradation and even clear card design and printing. We carry a variety of paper stocks and colors. We can take your designs and print them, or we can create them for you! Your business card can be very boring… or quite remarkable! It only takes your decision to let us help you. Let our outstanding design skills set you apart from everyone else! The front side of the card can be used to show full bleed graphics and photography and utilize the backside of the card to give detailed information about your business. We can one-color cards, full color on the front and one-color on the back, or full color on both sides! Full color printing on 14pt Gloss Coated Card Stock with UV coating (lamination)on the color side(s). Size 3.5"X2". Full color printing on 14pt uncoated Card Stock with UV coating (lamination)on the color side(s). Size 3.5"X2".